Islamabad: An explosive material and detonator packed in a black bag recovered from a vehicle of senior journalist and Geo News anchor person Hamid Mir. According to the Hamid Mir, he returned home after visiting a photo copying shop in F7 Islamabad when his neighbor’s driver detected the bomb being planted under his vehicle. 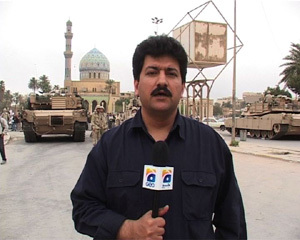 The bomb squad was quick enough to reach the spot and dismantle the bomb within half hour, stated Hamid Mir. Hamir Mir while talking to the television said that the driver of his neighbors pointed out the presence of a suspected black bag inside his vehicle. He said that he called the BDS to defused the bomb.